At almost this exact time last season, one of the combatants in El Clásico was struggling to hit its stride despite succeeding in the table, suffering some growing pains from integrating a brand new coach and his brand new style of play. Rumors that the team’s biggest star didn’t get along with the manager persisted, as did whispers that the team itself didn’t buy into the coach’s vision. Meanwhile, their opponents, fresh off winning the biggest trophy in the game and settling into a comfortable groove, wanted to really jam their foot into their rivals neck by snatching three points here and sending the other side into a tailspin of frustration and recrimination. And this year? Well, it’s almost the exact same script, only the roles are completely reversed. Last season, Barcelona were the ones trying to adapt to life under former Blaugrana player Luis Enrique in his first spell at the reigns. Heading into the Clásico they were atop the table and had yet to concede a single goal in the league. Yet the team did not look all that fluid in attack, in large part thanks to Luis Suárez’s absence and Luis Enrique’s strict, apparently less tactically intensive style of play that bristled the vets on the team—none more so than Lionel Messi, who, rumor had it, was the protagonist of an extended player-manager beef. We all know what happened: Real Madrid beat Barça in the derby, the fault lines many suspected had developed finally cracked open, and by the turn of the year, it was all-out chaos. Then they rallied together and dominated the sport en route to a historic run as La Liga, Copa del Rey, and Champions League title winners. This time around, it’s the Blanco side that’s looking unstable. On paper, you wouldn’t know it. Real boast the most goals scored in the league and the second-fewest conceded. Despite the tricky transition from Carlo Ancelotti’s open and expressive system to Rafa Benítez’s more disciplined, structured style, they’re only three points behind the reigning European champions in the table and are atop their group in the Champions League. Under normal circumstances, that they’ve accomplished all this despite a number of injuries to crucial attacking pieces, and could vault to the top of the table with a win at home this weekend, would be cause for celebration. Instead, many people are freaking out—and not completely without reason. Being three points behind Barça in the table this early in the season wouldn’t usually be cause for concern, but this is a half-strength Barcelona team that has been devastated by injuries. When Messi went down in late September with a knee injury that has kept him out since, Real Madrid had a golden opportunity to run out to a lead. Instead, Real have given up their share of the number one spot, thanks to relatively poor performances all around. The crux of Real’s problems, both real and perceived, lie in attack—which is especially disconcerting when you look at all the huge names on their roster. Besides two blowouts of less-than-competitive Real Betis and Espanyol, the Blancos have rarely played up to their potential in the final third. This was a fairly predictable turn of events, since Benítez has always prioritized careful defending to fluid offense. Real are extremely compact when out of possession, and every player on the pitch knows they are expected to protect their teammates defensively by adhering to their well-regimented roles. This has lead to their stinginess in defense, as have the heroic displays from the goalkeeper they were this close to getting rid of, Keylor Navas; but it has also restricted the freedom of players like Isco and Ronaldo and Toni Kroos, hampering their efforts when hunting for goals. Also contributing to their woes—and again, this is all relative; they’re only three points off the top spot—have been injuries. Gareth Bale has missed time with injury. Karim Benzema has missed games for being hobbled (and his, uh, off-field issues probably haven’t helped). James Rodríguez—who’s growing into the player club president Florentino Pérez wishes Bale would be, the best player on the team and soon-to-be rival of Neymar as the best young hotshot in the whole world—has only recently returned after a lengthy spell on the sidelines. 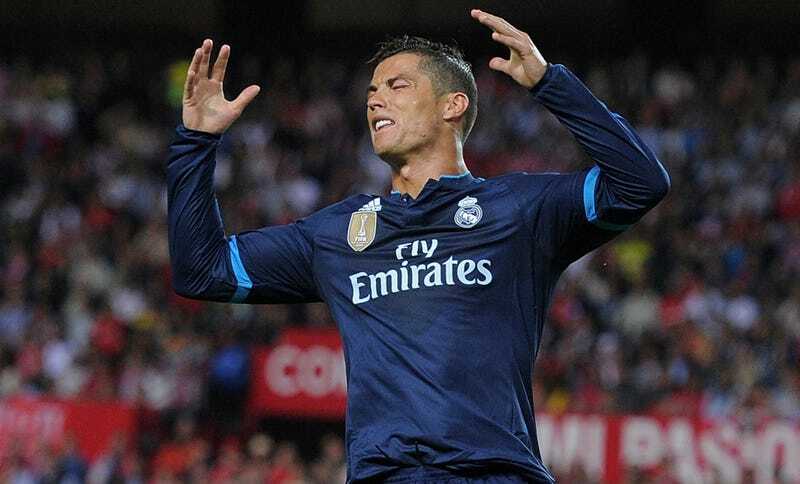 Because of this, Benítez has asked Ronaldo to play as a central striker more often. While you’d think putting such a lethal hitman closer to goal would only increase his productivity, this hasn’t been the case. Ronaldo needs the freedom and space he’s afforded on the left wing, where he can float inside and out in search of pockets of space from where he can pop off a shot. Playing alongside a typical center forward who focuses on more of the hold-up play and occupying the center backs, Ronaldo roams the field free from any distraction, looking only for the best place to score from. CR7’s eight goals in 11 league matches are fine stats, but five of them came in one match and for much of the time he’s looked confused and out of sync. Which is why it’s so imperative that Real win on Saturday. As absurd as it seems, given both the standings and how Barcelona shrugged off a herky-jerky start last year, this team really is a powder keg only a couple sparks away from exploding. A draw wouldn’t be the worst thing in the world, but a loss would give a severely hobbled Barça team a six-point lead in the table just as they’re getting reinforcements. (Iniesta, who had missed a few weeks of late, is now back fit, and Messi will almost certainly make his return in the Clásico. Summer additions Arda Turan and Aleix Vidal become eligible to play in January, which is also when the club can reinvest in whatever else they need.) Losing would mean more pressure on Benítez, more tension inside the locker and board rooms, and could result in drastic action being taken (Firing the manager? Trying to ship Ronaldo out in January?) out of panic if nothing else. A win, on the other hand, would do much to still the waters. Benítez is a defensive-minded manager, but the same was true of José Mourinho and that didn’t stop them from developing into one of the most overwhelming forces in the game on both sides of the ball. Giving Benítez more time to marry his system’s requirements to the skillsets of his players would be the smart play at this stage, and would be easier to sell to fans, the media, and most importantly the players themselves, if he could mount Barça’s scalp on his wall. And with everyone finally healthy, there’s reason to believe they can push on and become the team they should be this season and beyond. If they do lose, though, things will certainly get dicey. A loss could be enough to cause the club to self-immolate, star players pouring gas on the manager and the president threatening to set them all ablaze just to be rid of it all. Of course, as happened to Barcelona just a year ago, a loss could just be what they need to inspire them to stamp out the existing flames and win everything. It could go either way, and that’s what makes it scary and exciting: everything that happens from here out begins with El Clásico.